It was an exciting day for many in the community Sunday afternoon as the public was able to view the beautiful Oak Wood Estates, in Stronghurst, the new Assisted Living facility that was built in front of its sister business Oak Lane Nursing & Rehab. Over 200 came between 1:00 and 5:00 p.m. to enjoy refreshments of cake and punch and to experience the luxury and warmth of this business that could be their home some day if they so choose. Madeline Dowell and Elizabeth "Betty" Drevland were ready for their evening meal and were ready to get off their feet. Madeline said, "I looked out the apartment door and there were so many people, and many came in and visited." Betty said, "There were many I knew, so I just wanted to come out and say "Hi!" She was really enjoying it and is looking forward to when some more residents move in. According to Administrator Bobbi Tapscott and Executive Administrator Richard Clifton, all the Board members and the entire staff, except for one was present to help with the open house. The last two years, Diana Doran, President, and the other board members have been very busy with the makings of Oak Wood Estates. Due to all the hard work of Diana Doran, the board named the room where the fireplace and piano are "The Diana Doran Activity Room," which looks like a wonderful comfortable living room. Although Diana was reluctant to accept that honor the board had their way, saying it will mean a lot to your kids and grandkids someday. 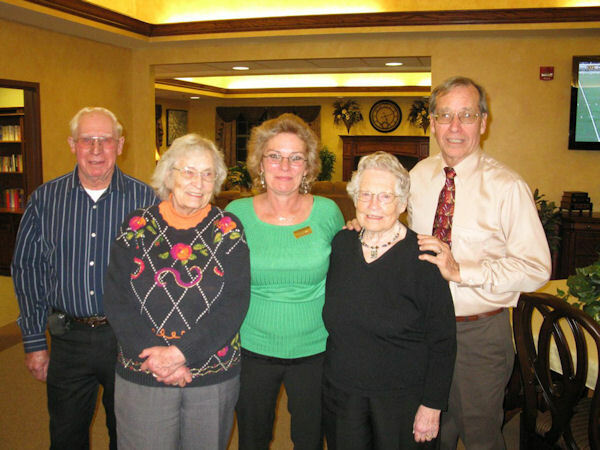 Diana Doran, along with the help of the board, has been a driving force in making things happen at the Henderson County Retirement Center's Oak Lane Nursing & Rehab and Oak Wood Estates Retirement Village. Mr. Clifton said they have talked about putting up Independent Living Duplex homes on their property next door and some they own near Forts Pond but for now, the board is exhausted and will put it on the back burner until Oak Wood Estates is in full swing. Oak Wood has a lot to offer. Three well-balanced meals, snacks anytime, transportation assistance, emergency response 24/7, activities and recreational and health programs, all utilities paid except phone, though there is one in the library available for use. Wireless Internet, basic cable TV, laundry service, beauty shop, treadmill, personal mailboxes, parking spaces, library and computer room, dining and living-activity room, whirlpool room and a friendly caring staff 24/7. Also nursing services, health monitoring, medication set-up and reminders, help with personal care if needed, staff certified in CPR, and daily interaction with staff. Apartments have locks on their doors, and residents can come and go as they please just like they do in their own homes. Besides Richard Clifton and Bobbi Tapscott, staff include Alicia Annegers-RN, Jessica Klees-CNA, Jacque McGraw-CNA, Amanda Hicks-CNA, Connie Thompson-CNA, Brittney Grafton-CNA, Donna Nelson-CNA, Mary Ann Stimpson-RA, Beth Wooters-RA, Patricia Harpin-RA, and Kim Inghram-RA. Board members are Diana Doran, President, Ralph Tatge, Vice-President, John Allaman, Treasurer, Nancy Stevenson, Secretary, Tom Edmonds, Tony Griepentrog, Sally Fisher, Judy Roessler, and Gene Turner. from left: Ralph Tatge, Bobbi Tapscott, Richard Clifton stand with residents at Oak Wood after a busy day entertaining 200 guests Sunday.